Last updated 3/10/2009 by David Giblin. Publication: Lindleyana. 14: 193, figs. 1–5. 1999. 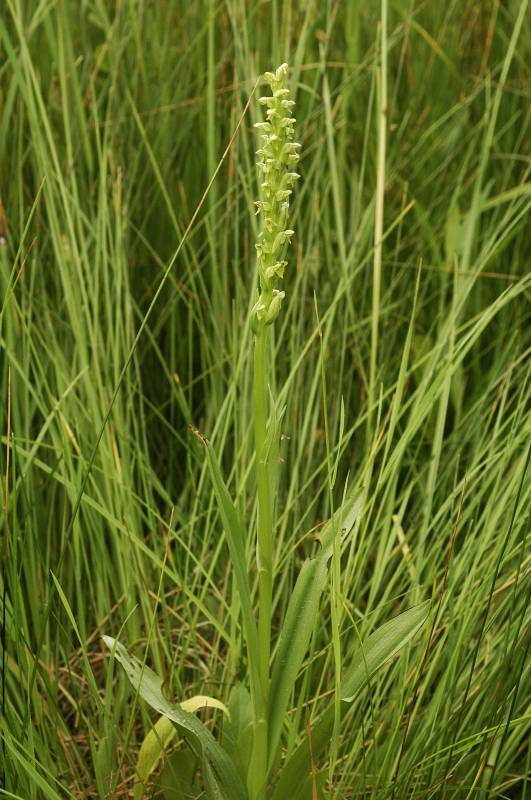 Notes: Recently described (Sheviak 1999b), and difficult to distinguish from Platanthera huronensis. FNA26: "Flowers of Platanthera aquilonis are usually scentless, but in the far northwest they have a sweet, pungent scent, like that of some related species. The flowers are commonly self-pollinating: the pollinia rotate forward and downward, contacting the stigma, and/or the pollen masses dissociate and are deposited on the stigma as if they had sifted downward. Platanthera aquilonis is a North American diploid species long confused with the tetraploid Icelandic P. hyperborea (Linnaeus) Lindley. Flowers of both species autopollinate, although the details of the mechanisms may differ. The two species differ in column structure and lip and viscidium shape. True P. hyperborea is similar to P. huronensis, and the relationship of these two species needs further study." » Sheviak, C. J. 1999b. The identities of Platanthera hyperborea and P. huronensis, with the description of a new species from North America. Lindleyana 14: 193-203. » Sheviak, C.J. 2001. A role for water droplets in the pollination of Platanthera aquilonis (Orchidaceae). Rhodora 103: 380-386.